The Chartered Institute of Management Sri Lanka held its fourth Talking Point recently, themed ‘Digital Transformation: The Key to Enhance Customer Experience’. The event included a keynote address by Sri Lanka Telecom (SLT) Group Chief Planning Officer Mahinda Herath followed by a panel discussion including Herath, Kapruka.com Founder/Chairman Dulith Herath, zMessenger Co-Founder/CEO Jayomi Lokuliyana and eMarketingEye Founder/CEO Rajitha Dahanayake, moderated by Takas.lk Co-Founder/CEO Lahiru Pathmalal. He added that a majority of consumers had switched from traditional marketing and customary sales to digital marketing and online sales. As a step to achieving digital transformation Herath suggested considering softwarisation. “Softwarisation inclusive of cloud computing and automation can lead to huge cuts in operational costs as it is an agile and virtualised next generation of networks and developing digital services within a company can lead to increased revenue after the digital transformation takes place,” he said. Mahinda Herath stated that this was how a traditional service provider should approach plans for digital transformation as it also guaranteed quality, efficiency and flexibility in addition to helping cut down costs. He further said that the digital maturity model offered a practical approach to digital transformation as it enabled to measure the progress of the transformation process along with other structured approaches such as digital frameworksElaborating on the steps to be taken in order to implement digital transformation in Sri Lanka, he said: “Access to internet and related equipment should be equally available in urban, rural and even estate areas in order for digital transformation to take place successfully in a local context.” He added that we had a long way to go in terms of broadband availability. During the panel discussion Dulith Herath said that digitalisation in retail business was growing rapidly at almost 20% month on month (MoM). He added that he had even observed a huge demand for ecommerce-based trade from rural areas of the country. However, he pointed out that there was a lot more to do in the ecommerce sector of Sri Lanka despite the accelerated growth. “Ecommerce based transactions are still at tiny fraction of less than 1-2% of total retail transactions, it’s still a blank sheet,” he said. Speaking on the advertising industry, Lokuliyana said that the entire marketing industry had become data driven since more and more businesses had become keen on identifying consumer behaviour online through analytics. “We no longer give that job to a media planner since it is possible to get it done using a computer through artificial intelligence,” she said, adding that anticipating consumer behaviour was not as unrealistic as one would think since it was already happening. “Digital transformation has totally changed the game of advertising and media placement,” she noted. Elaborating more on the impact of digital transformation on marketing, Dahanayake explained that digital driven marketing had been taken a step further with personalised marketing. “Everything starting from consumer preferences and demographic data can be tracked,” he said. 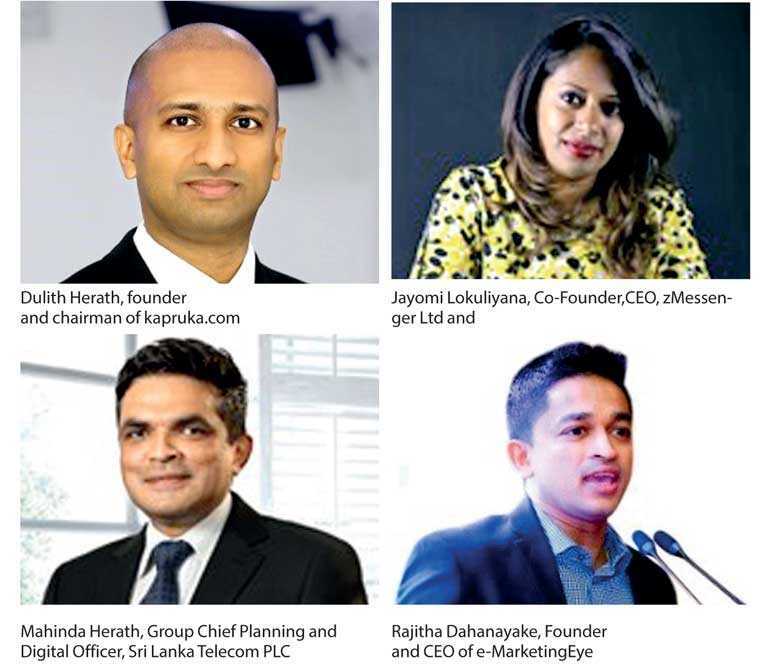 However, Dahanayake said that when moving into e-business a company should not burden the IT department with the entire responsibility since digitalisation was more about understanding new strategies and less about technicality. “The biggest challenge is getting the right people to manage digitalisation,” he expressed. CIM is the world’s largest professional body for marketing. CIM Sri Lanka Region is the fastest growing CIM body which serves over 3,000 studying members and 1,000 members assisting them in developing their professional careers while fostering the business landscape of Sri Lanka by harnessing marketing knowledge and building marketing competencies.